The Hilton Inn at Penn is Located in the heart of the University of Pennsylvania's campus and is a recipient of a AAA Four Diamond rating. The Inn is adjacent to the prestigious Hospital of the University of Pennsylvania, Children's Hospital of Philadelphia and the Avenue of Technology as well as Drexel University. The Hilton Inn at Penn is only a few blocks from Philadelphia's business district. Our beautifully appointed guest rooms are equipped for the technologically sophisticated and include two dual-line phones with voice mail, dataports and high speed internet access. Each room also offers WEBTV, plush terry cloth robes and luxurious bath amenities provide a touch of indulgence. Additionally, a refreshment center is now located in each guestroom with snacks and refreshments along with an in room safe for valuables and laptops. Penne Restuarant and Wine Bar and our Living Room Lounge will make guests feel at home. 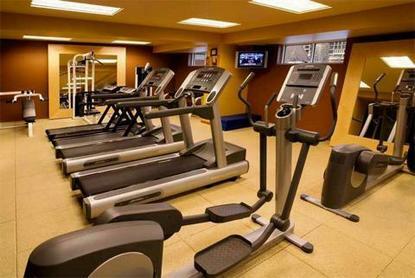 For more strenuous activity, our 24- hour fitness center has a full range of cardiovascular and weight training equipment. For a superb location and first-class accomodation- It Happens at the Hilton.